Player Bases are a feature added to the mod in version 4.86 Update 4. This feature allows players to construct persistent yet destructible bases any where they wish. The bases require regular supply to maintain as they have a built in decay rate to prevent unused bases from flooding the game space. Player bases serve as the means to producing some of the new items that were also introduced with 4.86 Update 4; cloaks, jump drives, hyperspace scanners, and docking bay modules. The latest modules are: Cloak Discruptors and Hyperspace Matrix. In addition to myself, Pimper has helped in testing various parts of the player base feature. Tel-Aviv & exdeathevn have both provided video tutorials. This tutorial was made to help newer or even older players. If something seems off post a message here or below. This tutorial was made by @Daedric. • Keep in mind that you will need to supply the base daily in order for it to survive. Proximity to the basic commodities that make your station tick is extremely helpful. • Many of the houses currently have in role play laws restricting or forbidding the construction of player stations in their ZoI. Do your homework before setting up shop. Otherwise you may find a large fleet of battleships parked outside beating the doors down with mortars. • If you know your base will eventually be assaulted, remember that asteroid fields hinder battleship movements. • Player bases also take no damage from radiation fields, placing one inside a field will give it a passive defense mechanism. • Once you've found that prime location you're set. Zoom that Base Construction Platform to your location and remember, once you enter the command the base will appear 200 meters in front of you, with the docking bays facing you. Re-positioning a base is impossible. Be sure you're happy before you enter the command to construct the base. • <password> this part of the command sets your master admin password; no spaces are allowed and there is no character limit. This password allows you to create and clear regular admin passwords. Do not give it out to anyone you do not trust with your station's life. • <base name> this part of the command sets the display name of your station; spaces are allowed, but there is a 60 character limit. • <password> this can either be the master admin password you set or, after you've set up a 2nd tier password you can use that one here. The only difference between the two tiers is tat a master admin can remove a 2nd tier admin password. • <tag> is either the name of the ship or the faction tag prefix. Stations cannot detect suffixes, so don't bother entering them. An example would be OSI-. (no period) This would allow anyone with OSI- as the first four letters in their name to dock to the station. Be careful adding entire ship names as tags. If you enter HeavyTransport as a tag and someone has a ship named HeavyTransport1 they will be given permission to dock. Station control is still very simple. If you add a tag, all ships with that tag are considered allied. Everyone else is either neutral or hostile depending on the station's defense mode. More about that later. • This is a 2nd tier admin password. Give it to those who will help you administor the base. • This is a 3rd tier password. Give it to those who supply your base. It allows them to view shop only, so it's easier to spot when the base requires food or repairs. Or park one of yours nearby and F1 it when no one is around. After you've done what I've instructed you to do above, log into that ship, dock, login as an admin, and then sell the commodities to the base. Now go get more Reinforced Alloy. You'll need to feed the base a steady supply of Reinforced Alloy until it completes construction. Your base isn't completed just because you typed in a Hook command! It starts out at 5% of is maximum hit points, all that Reinforced alloy is to see it to 100%. It will take several days to do so, depending on how many repair commodities you are using. Around 5 days for three of them, or 15 days for one. My advise at this point is to quickly begin getting the materials for a Shield Generator Module to the station and begin its construction. Without this module, your base is a sitting duck in a pond full of hunters. Keep in mind bases that are not kept supplied will perish. All cargo and credits on the station are lost. Ships docked to the station at the time of its demise will appear 100k below the system's sun when they un-dock. If you attempt to construct a base and you do not have all of the required commodities; the construction will eat everything you have, but fail. Ensure you have everything required before you enter the command to construct the base. If you attempt to construct a base and do not give it a name or password all of the required commodities will be remove from your cargo hold, but not base will be deployed. Want to know the cost and time it takes? Take a look at the below. It will cost 642.5M to build and will take a total of 461 Trips using a 5ker. What are base levels? Before I answer that question, let me explain what a Base Core is. A Base Core is module slot 0 on your base; this slot is effectively the base. A Base's Core can be upgraded four times; Core 2, 3, and 4 and 5. All bases start at level 1. Upgrading a Base's Core increases the number of modules it can house, increases the base's hit points, and also increases the number of Spaceship Crew required to effectively operate the base. I've listed the base stats for each base level below; these stats do not include any modules you may have constructed. Remember, construction will pause if you run out of all of these goods. Once complete, the base stats will change immediately to reflect the new base level. You will need to ensure you have an extra 200 Spaceship Crew dropped on the base very quickly after a Core Upgrade completes otherwise the base will not operate effectively; repairs won't happen. Core Upgrades are currently the only modules that modify the appearance of your station. This is the complete cost in terms of commodities to upgrade your base from Level 1 to Level 4. This doesn't seem like much, but the time investment is far larger. This figure is also mostly unobtainable as it is doubtful you will be able to access every base that sells the above commodities the cheapest. What are modules? Modules are how you expand your station. There are storage modules, defense modules, and factory modules. Each requires commodities to be built and take up one module slot. In order to construct a module you will need to enter a Hook command. • To begin construction of a new module you need to select what module you want from the list of available modules and then what slot you want it to occupy. Remember, slot 0 is your Core and you cannot construct anything in it. This means you want to construct a number 3 module and put it into slot 2 of your base. You will get a message telling you that construction has started - and you can keep track of it by pressing F9 or using the /base buildmod list command. Construction requires that you have at least 200 units of one of the commodities required to construct the module. If you do not have at least 200 units of one or more of the commodities required construction will pause. The base will consume commodities in blocks of 200 every 16 seconds. If the current commodity it is consuming drops below 200 it will look for another required commodity and begin consuming that. Commodities cannot be combined to form a 200 unit block. It only consumes 200 of the same commodity. You can cancel module construction at any time by using the destroy command. • Care must be taken not to fill your base with commodities which are not needed for current construction projects. It may be prudent to disallow selling new commodities to your base for a while. See 'Shop' for commands related to this. • <index> this part of the command references the module that will be constructing the item. It refers to the module as it is installed on your base. This means you want the factory located in slot 3 of your base to build item 7. Using this base and the /base facmod image from above as examples, this command would instruct the Hyperspace Scanner Factory to build a Hyperspace Scanner Module Mk3. Construction requires that you have at least 200 units of one of the commodities required to construct the item.If you do not have at least 200 units of one or more of the commodities required construction will pause. The base will consume commodities in blocks of 200 every 16 seconds. If the current commodity it is consuming drops below 200 it will look for another required commodity and begin consuming that. Commodities cannot be combined to form a 200 unit block. It only consumes 200 of the same commodity. This factory module will allow you to construct Jump Drives. Jump drives are items that allow the vessel the are mounted on to jump to a pre-set destination or randomly. Jumping to a pre set destination requires the use of a Hyperspace Scanner. There is no range on how far a jump drive can move you, you're limited only by the coordinates that you have. This is a list of the current jump drives that you are able to build once you have a Jump Drive Factory and information on them. • Fuel Consumption Rate: 420 batteries. • Fuel Consumption Rate: 450 batteries. Usage: An intro into using jump drives. Typing /charge will begin charging the drive, fuel is consumed at this time. Once the charge reaches 100% it will hold there and continue to consume fuel until you type /jump at which point you will jump. If you entered hyperspace coords using the /setcoords <coords> you will jump to that location; otherwise you will perform a blind jump to a random location. When you use the /setcoord command, it will confirm the location (system) in which you will be jumping to, if you enter the coords incorrectly or they are out of date, you will get a parity error. 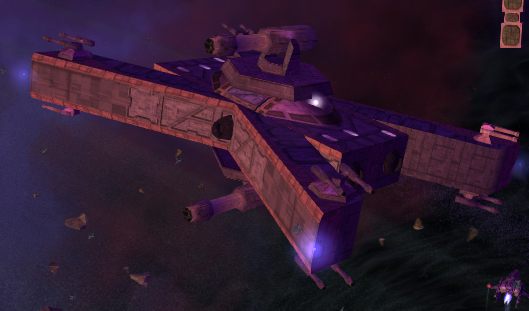 This is a list of the current hyperspace survey modules that you are able to build once you have a Hyperspace Survey Manufacturing Factory and information on them. In order to get a set of hyperspace coordinates you fly out to the location you want to be able to jump to and then use the following command. Cargo Requirements: 600 + 2 for each battery. • Usage: An intro into using cloaking devices. • Typing /cloak will activate the cloak and begin its Time to Cloak delay; when this delay is over your vessel will cloak itself. Fuel is consumed during the Time to Cloak delay. Usage: Here is a brief intro into using this item, for a more detailed explanation please use Charos' Docking Module Tutorial. To dock to a vessel with a Docking Module equipped you first must be within docking range (200-300m); when in range merely press dock. This will send a request to the vessel with the Docking Module notifying him/her that you wish to dock. They must target you and type /allowdock. • You cannot sell anything to the equipment or commodity vendors on the vessel you dock to. • When you undock you will appear near the vessel you are docked with, even if it has moved between systems. If vessel you are docked with docks to a player base or NPC base and you undock, you will appear outside whatever base the vessel docked to. • If the vessel with the docking module is killed, you will spawn 100k below the center of the map. • To remove docked ships from your bays, type /jettisonship <shipname>. Shipname IS case sensitive. • Usage: By typing /disruptor or by setting a key ( Options > Multiplayer .tab > Cloak Disruptor ON/OFF ). Weapons platforms take damage while the shield is online and are destroyable. This does not destroy your defense module. Weapon platforms do take damage from the environment and this damage does activate the shield. If a weapons platform is destroyed it will respawn 15 seconds after its destruction. • Defense modes are settings that tell your base how to treat those who approach it. There are currently only three settings. You set these modes with the following command. Docking Rights: Whitelisted ships only. Docking Rights: Anyone with good standing. • NPCs ignore player bases. Player Bases ignore NPCs. • Bases have no IFF and no faction diplomacy. The only thing a base recognises as an ally is whatever you set out in the list of nametags. See 'Docking Rights' for more information. Freelancer uses a three-dimensional coordinate system, one set for position, the other set for orientation. So you have to type in a set of 6 numbers to get a platform positioned where you want it. • Fly out of the base and pretend you are the weapons platform you just made. • Park yourself as you would like the platform to be positioned. • Write down the numbers generated by the command. • Type /base defmod list - this brings up a list of all the defense modules you have, and their current positions. To set the position of a module, type /base defmod set <index> <x> <y> <z> <rx> <ry> <rz> where <index> is the module number from the /base defmod list command and <x> <y> <z> is the position of the platform and <rx> <ry> <rz> is the orientation of the platform. Arguably the first module you will want to construct on your base. This module will give your base the ability to use a shield; which will turn on when the base is attacked and reduce all incoming damage by 97%. This damage reduction is only in effect as long as the shield is up and running. In order to keep the shield online you will need to supply your base with fuel for the shield. All damage that activates the shield is reduced by 97% also. To build a Shield Generator Module you will need the following Commodities. If you use this command to manually activate the shield it will stay on for up to 8 hours, provided there is enough fuel. It is important to keep a good fuel supply on the base as it is impossible to dock to a station while the shield is online. You can deactivate the shield using the above command and dock, this will leave your base open to direct assault. Deuterium - 5 units per 16 seconds. Gallic Fuel - 3 units per 16 seconds. This modules adds an extra 40,000 cargo to your base. Once built, you will have immediate access to the extra space. Just like storage space on ships, base storage is volumetric. If a commodity takes up more than one cargo unit on your ship; it will take up more than one cargo unit on your base. Docking Rights are one of the most important aspects of operating a player base. As the title suggests, this section focuses on the commands and settings to control who can and cannot dock on your base. This is currently controlled by what we on Disco call tags. • You add the tag BigTransport to your base's docking rights. Any ship with BigTransport at the beginning of their name will be able to dock to your base. BigTransport1, BigTransportKiller, etc etc. • You're typically going to want to restrict access to faction tags for security reasons. Only prefix tags work. Tags that are suffixes will not work. Sorry. This command will invoke a Freelancer style interface. This interface is the in game help feature for base commands. This command allows a base administrator to easily change the master password. Allows an administrator to access the base command functions. Lists all passwords except the first password. Since the first password is not listed, a base owner can keep their password secret but allow other players to be administrators of the base. Adds an administrator password to the base. • This command allows the base administrator to set the base info-card text that is shown when the base info icon is clicked. • <paragraph> The paragraph number in the range 1-5. List the current balance of the base's bank. The base needs money to buy goods off players. Unlike player ships, the bank can hold many times more than 2 billion credits and is essentially unlimited. Add credits to the base's bank. Remove credits from the base's bank. Both the trade window and equipment window are controlled via the shop Hook commands. Lists commodities, prices and buy/sell status for all goods held by the base. By default the shop will not accept goods that it does not already have in its shop status list. This simple command brings up a Freelancer-style interface, where you can see your listed goods, their price, as well as the minimum and maximum cargo allotments for each good. The screen also displays the other ship commands available to you. This command allows the price of goods, and their quantity in the shop to be controlled. • <item> refers to the number of the item as listed by the /shop status command. • <min stock> is the minimum cargo allotment for a commodity. A commodity will not show up for sale if the amount of it is less than • • <min stock>. • <max stock> is the maximum cargo allotment for a commodity. A base will not let you sell any more of a commodity, if the current stock is over <max stock>. Allows you to completely remove a commodity from the base. Show the shop stock list for <page>. A maximum of 40 items are listed per page. This is a list of the commodities that your base requires to operate. If not provided these commodities the base will begin to decay and eventually blow up. Food, Oxygen, and Water are used to feed the Crew. Reinforced Alloy, Robotic Hardware, and Hull Segments are used to make repairs to the base. Fuel is used to power the shield. Crew are a requirement for the base to operate. 200 per base level. • If Food, Water, or Oxygen numbers are less than the number of Spaceship Crew you have on your base (when the code makes its 10-hour check) then 10 Spaceship Crew start disappearing every minute. • Every 20 seconds the base will check for damage and use 2 Reinforced Alloy to repair the damage. Then it checks for damage again. If it detects more damage it will use 2 Robotic Hardware to make repairs. Then it will check for damage again. If it detects damage it will use 2 Hull Segments. It will repeat this cycle once for every base level. So, it will do it once for Base Level 1, twice for Base Level 2, and so on. This is one repair cycle that processes every 20 seconds. • If, after it makes repairs with Reinforced Alloys, it detects no damage it will not continue the cycle. If, after it makes repairs with Robotic Hardware, it detects no damage it will not continue the cycle.